Change doesn’t happen overnight, but when a whole generation of women start to follow a new trend which leads in a completely different direction than the existing one, you know there is something happening. We think it is safe to say the days of ‘heroine chic’ are over because not only do women want to see healthier versions of themselves reflected in fashion and advertising, but we have decided to take matters into our own hands, create our own followings and brands to show girls what is really important when it comes to body image. Plus size bloggers are hot property on the interwebs right now, especially fashion bloggers. There are two amazing gals who have been getting a fair bit of attention in the media for all the right reasons that we should all be taking more notice of. The first is Jes Baker, who writes The Militant Baker blog. She kinda went viral after posting her thoughts on the whole Abercombie and Fitch debacle where the CEO Mike Jeffries openly admitted the store doesn’t make clothes for larger women and they only want to market to the “cool kids”. (They have since turned that ship around and announced they will start selling clothes in bigger sizes come Spring 2014 in the US.) In response to the outrageous remarks made my Jeffries, Jes posted pictures from a parody shoot called ‘Attractive and Fat’ showing how ridiculous it was to even say what he did. Apart from heavily declining sales forcing Abercrombie to realize what a mistake they made, Jes’ photos were honestly the best thing that came out of that story, in a big “eff you” kinda way! 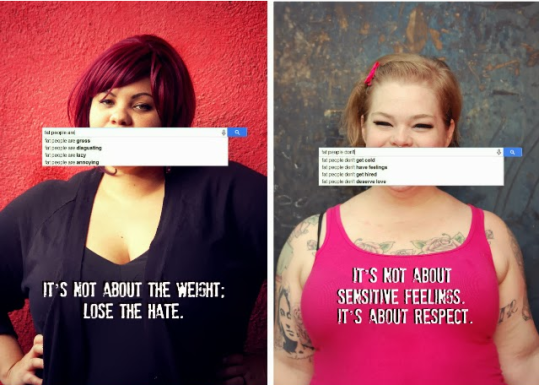 A recent blog post on her website has shed light on another issue: the way larger women are viewed by society as evidenced by the auto-complete function in Google. It centers around the theme of body-hating and body-shaming, and Jes wants us all to change our way of thinking. The idea for her experiment, and ‘social revolution’ as she calls it came from the Feminism Autocomplete Series by Policymic, showing the shocking ways society thinks about women. It’s appalling to think how many people still possess hateful attitudes. Jes’ argument is that larger women shouldn’t be forced to feel shame about their bodies and that they deserve to feel happy, fulfilled and beautiful even if they don’t fit into a narrow definition of what “perfection” is defined by society years ago. After the incredible responses she received on her blog, she decided to post another article about the issue, showing that it’s not just fat-shaming that is bad, but also skinny-shaming. There needs to be a drastic body revolution where the majority of society, worldwide, needs to come to grips with the fact that we are different. How can we all aspire to one type of unrealistic body shape, when we look around at real people and see we are literally all different? Perhaps common sense and some humanity should start to play a huge part in shifting our attitudes. The other blogger leading the revolution toward better body image is Los Angeles girl Tess Munster. She is a makeup artist, model, activist and found of the ‘Eff Your Beauty Standards’ movement. 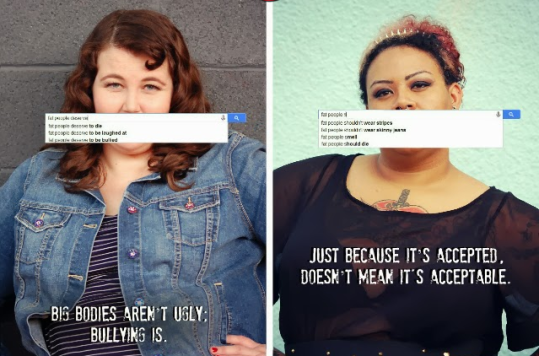 She personally has over 91, 000 followers on Instagram, and the #Effyourbeautystandards account has 13, 000. Her Facebook page has 153, ooo likes! This girl is on fire and clearly has something important to say that a lot of people want to hear. In a nod to her influence, she has been named one of the world’s top plus size bloggers by Refinery 29, Huffington Post and Vogue Italia. Her blog is called The Plus Size Life and she recently posted an article about how she learned to love her “fat naked body.” It was a candid display of someone who wants others to do the same, and not live life constantly comparing ourselves to other women. She writes how the thought of another person seeing her naked, despite the fact she has had a son and loves being naked at home by herself, was paralyzing. Both of these girls may have their own particular niche and branding when it comes to their blogs, but there is a huge commonality: they want women to love their own bodies, they way they are, warts and all. Enough of the fat-shaming, skinny-shaming, race-shaming, gender-shaming etc. Yes there needs to be a major overhaul of the fashion, entertainment and advertizing industries, but we believe it is going to start with us as the consumers. We have so much more power these days to make our voices heard. If you have an important message to share like Jes and Tess, then don’t wait for a gilt-edged invitation from the Queen of England. Do what you gotta do, and share your voice with the world. Start a blog, film a vlog, post a picture, a meme, start a facebook page and create a damn movement! Let’s love our bodies, support each other as women, and do away with the shame and the hate once and for all. Well done gals you both do amazing work. I am an average fullgrown adult woman, not underweight at all. Tess Munsters upper arm is bigger than my waist. Bigger than my hips, my bum, my shoulders. She is more than twice my weight. That’s all I’m saying. You guys are amazing and I have been very small and almost dies now I Gaines and weight and love it you guys are the bomb .I’m a cancer survivor would love a signed photo as to me you are hero’s.